Without question the movie-event of 2009 was James Cameron's AVATAR. There could have hardly have been any more hype and subsequent expectation placed on this film. Prospective-fans were ready to line up for midnight showings (among whom I count myself) and hammerhead-critics (among whom some would count me) began to circle as the blood of overhype began to fill the waters of the internet. Upon release, new fans were won across the land, while critics returned from the potential feeding-frenzy, quite full, but not in the way they expected. AVATAR is a super-hit and most everyone seems to be happy with it and about it. No doubt you've read and listened to enough online discussions and podcasts on the film, so I am not going to go in-depth here. Of course, the storyline of AVATAR really doesn't warrant going "in depth," because it is one that any moderate moviegoer will already know quite well. AVATAR's great achievement is in its stunning visuals and ability to deliver character performance-capture like never before. On those items there is no argument; however, comparisons of AVATAR to the impact of a STAR WARS or even THE MATRIX are wildly off course. Cameron's latest visual feast just doesn't operate on the same meta-levels as these predecessors. In the wake of viewing AVATAR, there aren't many deep philosophical questions, posed by the film's plot, being discussed by exiting audiences or kids pretending wielding their invisible weapon in play-battles. Are there any lines we repeat once we've left the theater? Do we whistle or hum any musical themes? No. AVATAR isn't THAT movie. Cameron's technical and photographic achievements in AVATAR are certainly due all the praise, but it's unlikely this film will make an equivalent impact on popular culture and I'm not convinced Cameron had this as a goal to start with anyway. If I can continue the STAR WARS and THE MATRIX comparison, I'd like to direct us to the point of each film's music. JOHN WILLIAMS' score for STAR WARS can hardly be overstated in terms of it's impact on the film...and later on the culture of the day. A similar thing could be said about DON DAVIS' music for THE MATRIX, albeit to a lesser degree. DAVIS' post-modern epic worked much more subtly, but, make no mistake, when audiences hear those reflecting brass swells, there's no question about what characters, scenes or images come flooding into mind. Both films feature scores that monopolize the genre. Any movie (or game) that adopts such a sound immediately draws comparisons to them. If AVATAR is going to be rightly compared with these classics, then it's score will have to approach such status. 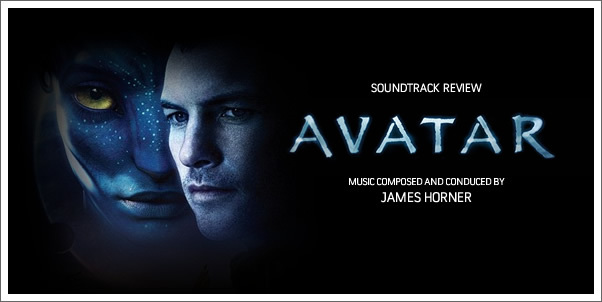 For AVATAR, James Cameron hired long-time collaborator, JAMES HORNER, to provide the musical character for his new sci-fi/fantasy. But does the resulting score help the film to become an icon of pop culture or is it transcendent in its own right?